From left: Luis García-Pelatti, Mario Marazzi, Joaquín Villamil and Antonio J. Fernós lead the discussion on the important of having comprehensive statistics for Puerto Rico’s tourism activity. The Foundation for Puerto Rico and Estudios Técnicos will work together to develop the first economic model of the island’s visitor economy, which is expected to be ready by September. The announcement was made during the forum “Perspectives on a National System of Tourism Statistics” organized by the Foundation to discuss its latest study on the sector. “This model will allow us to measure the economic impact of tourism activity across all sectors; validating the direct, indirect and induced impact from visitors to Puerto Rico’s economy. We will also break the perception that tourism in Puerto Rico is only about hotels,” said Arnaldo Cruz, director of research and analysis for the Foundation for Puerto Rico. The nonprofit unveiled last week its latest study on the visitor economy, which called for the need for a National System of Tourism Statistics, as this media outlet reported. Among other findings, the study confirmed that Puerto Rico’s lack of a comprehensive set of tourism data makes it difficult to the assess the sector’s performance, as the island lacks indicators to compare with the rest of the world. Likewise, it also presented specific recommendations ranging from the definition of concepts, consolidation of information, to the creation of a multi-sectoral advisory committee, among others. 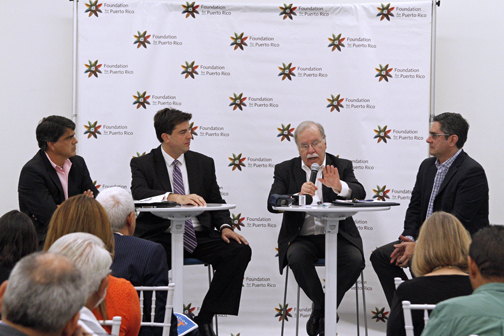 During the forum, a group of prominent panelists — Mario Marazzi, executive director of the Puerto Rico of Institute Statistics; Luis García-Pelatti, former chairman of the Puerto Rico Planning Board; Joaquín Villamil, economist and chairman of Estudios Técnicos Inc. and Antonio J. Fernós, economist and vice president of Advanced Research Center — confirmed the importance of having such data available. Marazzi said during his turn to speak that the Institute will begin working on theIncome and Household Expenses Survey in the next six months. The Foundation will be working closely with the agency to determine the expense of domestic tourism on the island. Hey Buddy!, I found this information for you: "Foundation for PR to develop 1st visitor economy profile". Here is the website link: https://newsismybusiness.com/foundation-visitor-profile/. Thank you.